2017 was a year filled with several blockbuster movies and CELEBRITY MARRIAGE which featured great actors such as Odunlade Adekola, Toyin Abraham, Tonto Dikeh, Osita Iheme, Jackie Appiah, Kanayo. O. Kanayo, Susan Peters and many more fall in this category. Celebrity Marriage centers around the personal lives of celebrities and how they manage their lives behind the glamour of the screen. It creates a picture of their marital lives, careers, struggle for survival, betrayals and many more. In fewer words, one can say Celebrity Marriage emphasizes, that beyond the beautiful smiling face on the screen, there is a myriad of problems facing some of our hardworking celebrities. Evaluating the movie is a tough one. Not for the exceptional brilliance, but for the near failure syndrome it almost suffered. The plot is not so bad, but definitely not good enough to pass for a classic film. However, kudos should be given to the writer for being able to create comedy around a very disturbing and recent issue affecting the entertainment industry. I saw in the family of Odunlade and Toyin, the real life of our superstar Mercy Aigbe and it was amazing how the writer could infuse such story to the letter without annoying the fans of the popular actress. The infusion of so many activities however, almost ruined the essence of the film. It would have been a smart move, had the writer selected a particular problem and dealt extensively with it, but, he was rather everywhere in the most appalling situation. 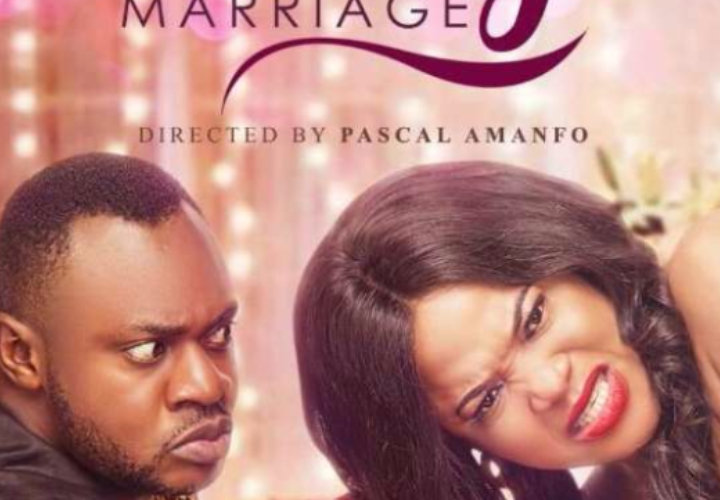 For example, Odunlade and Toyin represent a plastic family that manages to conceal the domestic violent husband, as the victim is a popular actress who simply wants to stay off bad press. Jackie Appiah plays a bi-sexual celebrity who feeds the secrets of her colleagues to her blogger friend. Tonto Dikeh on the other hand is a celebrity who is married but keeps using pills to avoid getting pregnant. These are three different issues, being depicted by three different families but the problem here is that, the writer struggled to treat each of these problems that he ends up choking the viewers with so many bad layered plots. He almost ruined the day. The most frustrating part of the film, is the infusion of the narrator who was totally not needed for the development of the story. The writer is not dealing with babies and the story is explicit enough for a rational audience. The acting is surely one important element to consider and believe me, you will enjoy a larger part of the movie especially with Odunlade Adekola and a few other actors. I must say there were cases of occasional over-acting from some of the actors which became quite annoying, however, they did manage to pull off each scene with an average level of good acting. To be candid, Celebrity Marriage is a good movie, which does not just feature amazing actors but has a good content. The flaws are not to be ignored but it’s worth the wait. Will Wura watch it again? Definitely. hmmmmm…… haven’t seen the movie though but with this evaluation amma go see it so as to get a clearer picture. Good assessment. Just the way I felt. Odunlade was not just at his best. He didn’t disappoint as usual. About the narrator. Not just about her irrelevance, she wasn’t a good narrator – the texture of her voice, her diction and all. However, as a viewer, I appreciate the confidence of the writer to do what a lot of writers out here have been leaving out untouched. Learning is a continuos discipline, thank you for doing what you do, we learn, we laugh and we grow at the same time. I’m glad you are having fun and learning.